What do these three things have to do with each other? A lot really! Service dogs are specially trained for those that need extra help. They are not pets. Some service dogs help those that are blind. Some help those that have hearing issues. 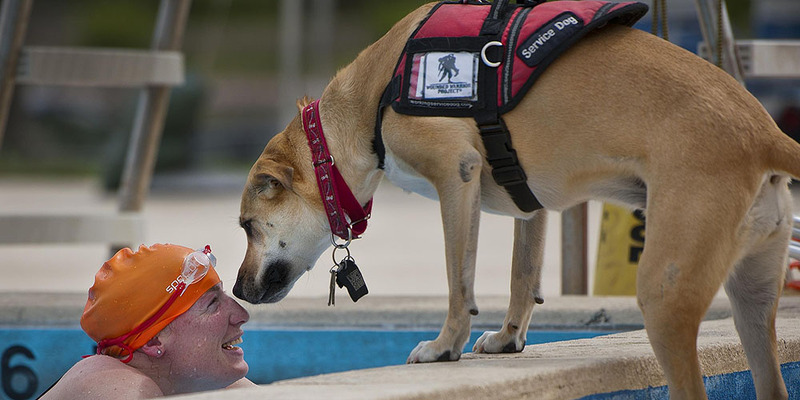 Some service dogs are for veterans with emotional issues. They all perform a service for their owner. A 2009 federal law requires that airports that serve more than 10,000 passengers per year to have a “Service Animal Relief Area (SARA)” inside the secure area of the airport. If a “potty area” for service dogs is inside the terminal, what else can you use except artificial turf? Not just any artificial turf but a specific artificial turf designed for dog use only. The experts at Watersavers Turf can help you select the right kind of pet grass for your dog run, your SARA, or any other turf project. Many airports have outside areas for dogs to do their business. If a service animal is on a connecting flight, they and their owner have to exit the secure area. Then they both have to go back through the secure area again. This can lead to missed flights and high-stress levels. More people are traveling with service animals. So, the federal government created new standards for relief areas, and a new law that airports have to meet by August 2016. These relief areas are specifically aimed at service animals. The new Service Animal Relief Stations have to be in the secure area of the airport. But how were airports to meet the new law? SARAs with synthetic grass are the answer. It meets federal law, and special synthetic grass used just for dogs is very easy to clean, and can be non-toxic and lead-free if bought from a premium turf distributor like Watersavers Turf. Synthetic grass cleans up quickly and reduces stress on people and animals. No more missed flights. No more standing in line for security again. In April 2013, San Diego Airport built an enclosed area as the first “inside” SARA. This 75 square feet space is floored with pet grass. It has free baggies for clean-up and a fire hydrant. A maintenance crew also cleans it twice a day. No more going outside in the cold, the rain or the heat to let your service animal relieve themselves. The Detroit airport built two SARAs inside their terminal in April 2014. One has real grass, and one has pet grass. The pet grass used in Detroit makes clean-up a breeze. There is a hose for owners to wash down the turf for the next service animal. This set up helps prevent the spread of disease between animals. Other airports are quickly following this trend and trying to meet the deadline of this new law by using pet grass for their doggie areas. Dulles International Airport, in Washington DC, has built a couple of SARAs. Customers clean up after their dog before they leave the area. Baggies are provided for solid waste. Dulles airport has push buttons that turn on sprinklers to wash away pet urine. Some airports have hoses installed for the owners to spray down the area after the service dog is finished. Some have built “doggie bathrooms” just like a regular bathroom that humans use. Many have paw prints to lead owners to the SARA. They all are required to have baggies for solid waste. They are also required to have a sink for owners to wash their hands. There are maps at the airports that show SARA locations. There are maps on the internet that show SARA locations. There’s even an app for your phone to locate SARAs! Look around the next time you are at a major airport to see how pet turf is making life easier for service dogs. Artificial grass designed for dogs is not just for use by service animals at airports. This special type of turf is designed to drain quickly and easily, so it can be used for other applications. The local experts at Watersavers Turf can give you advice for designing and installing their product in a dog run, or your own SARA. You can make a designated space just for Fido or Fluffy to use in the yard to rescue it from those yellow or brown spots caused by your pet. Call us at 844-974-8873, or visit one of our seven locations for a free quote or free samples.